More than $11 billion of transactions were announced globally in July as crude’s recovery fueled hopes of a steadier market, Wood Mackenzie Ltd. said. That’s the highest monthly total this year and brings the amount since May to $32 billion, triple that of the previous three months. Dealmaking will continue to accelerate as oil prices stabilize, according to the consulting firm. 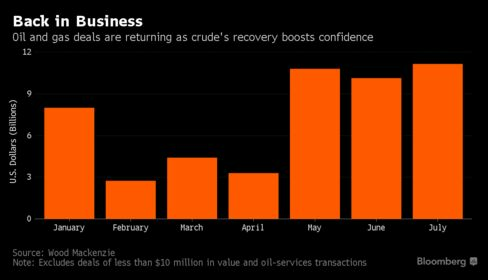 Exxon Mobil Corp. and Statoil ASA were among the buyers after crude’s rebound from a 12-year low earlier this year bolstered confidence. Acquisitions will allow the companies to ensure future growth as the industry has slashed $1 trillion in spending to protect their balance sheets during the downturn. Exxon, the world’s largest oil producer by market value, agreed last month to acquire natural-gas explorer InterOil Corp. for as much as $3.6 billion to add discoveries in Papua New Guinea. The company also is in advanced negotiations with Eni SpA to buy a stake in gas finds off Mozambique, people with knowledge of the talks said in July. Statoil, Norway’s biggest oil producer, agreed last month to purchase an oil block off Brazil from Petroleo Brasileiro SA for $2.5 billion, its biggest acquisition since 2011. The deals follow a period of relative quiet as buyers and sellers failed to agree on valuations amid oil’s decline. North America, home to many higher-cost shale drillers, saw the fewest transactions last year since 2004, according to data compiled by Bloomberg. 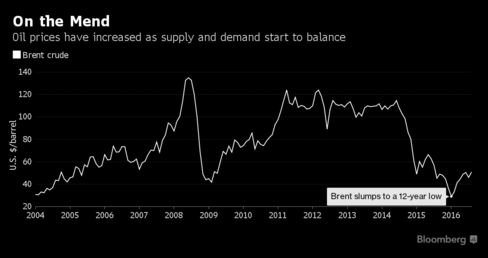 Benchmark Brent crude averaged $35.21 a barrel in the first quarter of 2016, the lowest in more than a decade. The grade traded at $49.57 at 2:31 p.m. London time. Buyers are taking a view there will be an oil and gas supply shortfall at the end of this decade and so are snapping up assets, analysts at Houston-based Tudor Pickering Holt & Co. wrote in a note Friday. Deals are also likely to increase because oil companies have fewer projects in hand. Those companies that did make acquisitions had little cash to draw on. Royal Dutch Shell Plc’s debt ballooned when it bought BG Group Plc, a rare mega-deal of the past two years, valued at more than $70 billion in April 2015. The transaction was announced just weeks before crude prices resumed their slide, prompting some analysts and shareholders to suggest Shell was paying too much. There’ll be plenty of assets up for grabs. Shell intends to raise $30 billion through divestitures in the three years to 2018, while BP Plc plans as much as $5 billion of disposals this year. Total SA and Eni also are putting assets on the block.